Rolls-Royce has taken the wraps off the highly anticipated 2018 Rolls-Royce Phantom in London. Here are the all-new Rolls-Royce Phantom's studio images giving a close look at its exterior and interior. The Rolls-Royce Phantom Mk8 is the company's first car to utilise the 'Architecture of Luxury' as the basis. The BMW Group brought the Rolls-Royce Phantom back to life, when it introduced the seventh generation model in 2003. Fast-forward 2017, the German auto giant has rejuvenated the flagship saloon by taking it to its next chapter. The eighth generation Rolls-Royce Phantom is perhaps the epitome of retro-modern design. At the front, the Pantheon grille is reminiscent of the futuristic 103EX's grille, but it is also influenced by the classic Rolls-Royce Silver Cloud. The portrait grille is raised higher, which has led to the Spirit of Ecstasy going approximately a half inch higher. 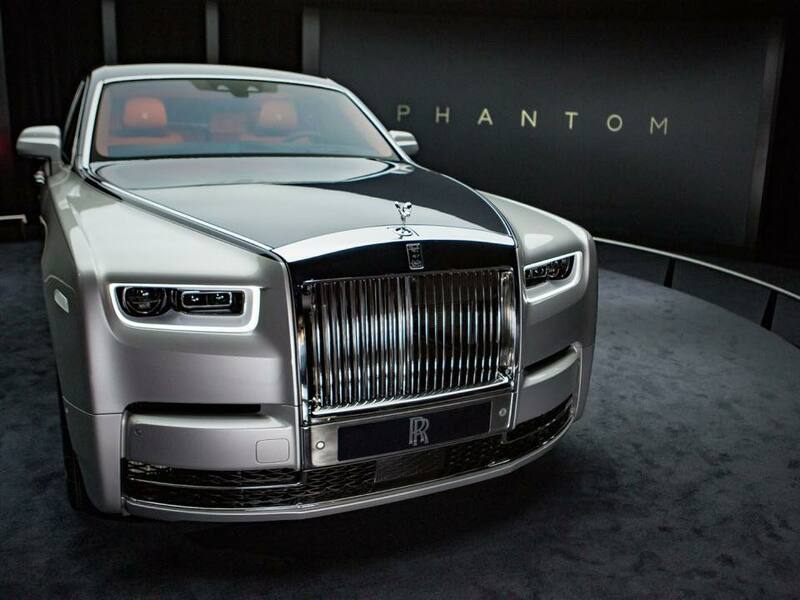 This is the first Phantom which has its grille integrated into the surrounding bodywork, for a minimalistic design. The new headlamp design is the most appealing fixture of the car's front. With a ring of daytime running lights, the headlamps incorporates laserlight system with a range of over 600 metres. The profile is cleaner now with notably reduced usage of lines and looks fluidic. At the rear, everything from the tail lamps, to the bootlid, the bumper and the tail pipes, are redesigned. Drastic differences aren't seen, but the subtle changes are well in line with the more fluidic and contemporary look. Stepping inside, or "stepping aboard" as Rolls-Royce would say, the 2018 Rolls-Royce welcomes the passenger to a familiar but considerably more luxurious and high-tech cabin. Embracing the advancements in the industry, the 2018 Rolls-Royce Phantom adopts a 12.3-inch LED screen for displaying driver information. The analogue clock has moved to the passenger side of the dashboard. It is right beside the centre console, like in the RR Ghost, RR Wraith and RR Dawn. To improve comfort, Rolls-Royce has appointed newly scuplted and hand-crafted seats in the redesigned Phantom. Behind the wood panelling on the rear of the front seats, there are electrically operated Rear Picnic tables and Rear Theatre Monitors for the rear-seat passengers. The rear seat choices include a lounge seat, individual seats with occasional armrest and individual seats with fixed centre console, as well as the new sleeping seat. The fixed rear centre console has incorporated a drinks cabinet, with whisky glasses and decanter, champagne flutes and coolbox. Looking up, the passengers can feel relaxed gazing at the artificial stars on the largest Starlight Headliner a Rolls-Royce has ever had. The 2018 Rolls-Royce Phantom is powered by a 6.75-litre twin-turbo V12 petrol engine. The 2018 Rolls-Royce Phantom measures 5,762 mm is long, 2,018 mm wide and 1,646 mm tall. It is 80 mm shorter in length, 28 mm wider and 8 mm taller compared to the previous generation. Measuring 3,552 mm, the wheelbase is 18 mm shorter, however there is an option of a long-wheelbase version with a wheelbase 200 mm longer than the standard version. The Phantom Mk8 is the company's first car to utilise the 'Architecture of Luxury' for its basis, which is approximately 30% more rigid than the spaceframe architecture of the Phantom Mk7. Powering the eighth generation model is a 6.75-litre twin-turbo V12 petrol engine. The company is yet to release the specifications of it. Sales of the Phantom VIII commence in 2018.